For years, you’ve had a beautiful deck. It’s been well-maintained and serves as a second living room when the weather is nice. Unfortunately, it’s not very private. Nosy neighbors take the fun out of family gatherings. Cars and passersby keep date nights from feeling truly intimate. Maybe you’ve just settled on the notion that your deck will never be private. That doesn’t have to be the case, though. Here are 10 tips to make your deck a personal oasis, as explained by Better Homes & Gardens. Add a fence – The easiest way to block a neighbor’s view is with a taller fence. Not only are privacy fences quick to build, but they provide a secluded space. Plant a tree – Is there some unused space in the yard where your deck is located? It’s not a bad idea to plant a tree. As it matures, the tree creates a soft, natural canopy that looks great. Plus, a new tree boosts property value. Incorporate the sound of water – Background noise from cars, lawn mowers, and barking dogs all but ruins quiet time on the deck. Consider adding some sort of fountain or other water feature to counteract annoying noises around your house. Use evergreens – Speaking of trees, have you thought about evergreens for privacy? What’s convenient is that these trees come in a wide range of colors, shapes, and sizes. Evergreens do a great job of blocking any view and providing a lush, green backdrop. Bring in some green – If you can’t build a privacy fence or plant a new tree, you still have options. Certain tropical plants and big-leaf plants also do the trick. It’s your call whether you want to move them in and out each season or treat them as exotic annuals. Build a trellis – Think of a trellis as a step up from a pergola. Take it one step further by planting vines along the deck line and watching as they wind their way up the trellis. Create a canopy – Awnings are so popular with homeowners because they serve two purposes. For one thing, an awning keeps you cool and comfortable even on the hottest days of the year. Secondly, they work to block the view from neighbors. Take your pick from a wide range of styles and options. There are also retractable options if you’re interested. 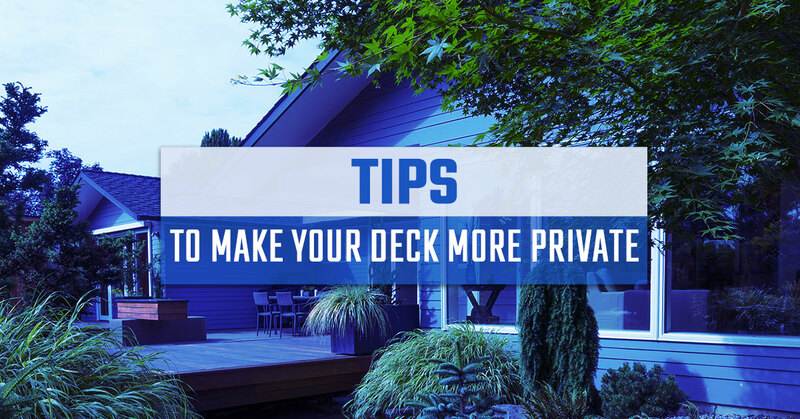 Focus on a section – It’s not always possible to block the view of an entire deck. In this case, create a garden of shrubbery, grasses, and flowers to create that focal point. Neighbors will be more drawn to the garden than your deck. Add vines – This is a great way to add privacy without breaking the bank. Vines add plenty of green to the space while also secluding it from others. Hang some fabric – Sheets of outdoor-friendly fabrics create just enough of a privacy screen. Similar to vines, fabrics are pretty expensive. Our deck installer combines high-quality materials with an innovative, patent-pending building system. For nearly two decades, we’ve made affordable decks a reality for homeowners. With Ready Decks, you get a pre-priced and custom-fit product that’s guaranteed to last. We are proud to have franchise locations across four states. You don’t have to settle for just any deck contractor or deck builder. Rather than scour through pages of decking companies, see what Ready Decks can do with your budget. Call our local deck builders to get started.